Peter X. Kelly, the chef-owner of four restaurants in the Lower Hudson Valley — Xavairs at Piermont, Restaurant X & Bully Boy Bar in Congers; Freelance Cafe & Wine Bar in Piermont and X20 Xavairs on the Hudson in Yonkers — featured his four executive chefs at a dinner showcasing classic dishes from all the Xaviars Restaurant Group restaurants at the James Beard House on Feb. 28, 2011. The menu was like a greatest hits of dishes from all the restaurants — even Xaviars at Garrison, the first restaurant Kelly opened, which has since closed. “I tried to represent the growth of the restaurants,” he says. 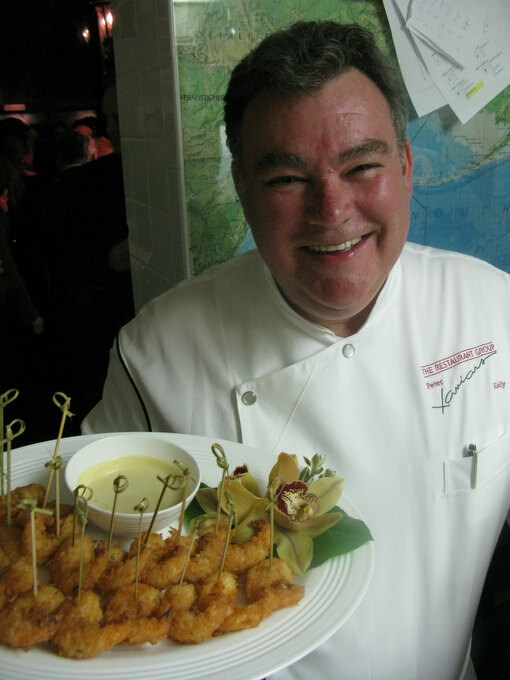 So that’s why Jumbo Coconut Shrimp, a perennial Xaviars favorite that’s been ont the menu “since day one,” says Kelly, was served as an hors d’oeuvre. Here’s a slideshow of the evening — mostly of the chefs working nonstop in the kitchen to plate a five-course dinner for 80 people in about an hour and a half! The menu, after the jump. what a night? great shots. Must have had a blast. Anytime you are in that company, good things happen. Jealous yet again. No women in this kitchen. Sorry to do it this way. After a fabulous meal at X20 Xavairs on the Hudson in Yonkers, I sent letter by post to Mr. Kelly asking about restaurant connections in Cambridge, MA. Is there any chance you have an email address for him?